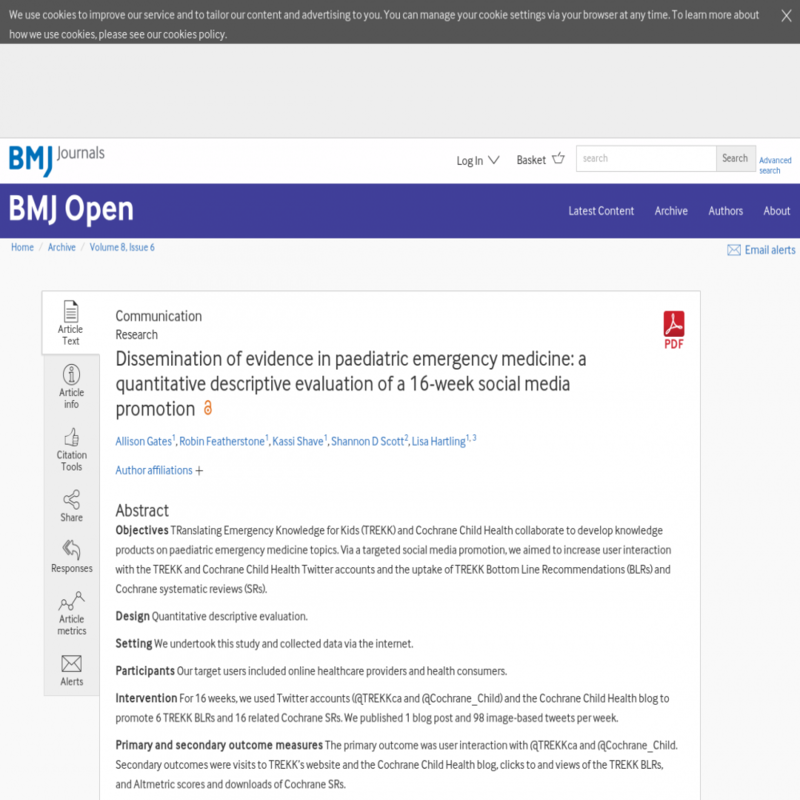 TRanslating Emergency Knowledge for Kids (TREKK) and Cochrane Child Health collaborate to develop knowledge products on paediatric emergency medicine topics. Via a targeted social media promotion, we aimed to increase user interaction with the TREKK and Cochrane Child Health Twitter accounts and the uptake of TREKK Bottom Line Recommendations (BLRs) and Cochrane systematic reviews (SRs). Quantitative descriptive evaluation. We undertook this study and collected data via the internet. Our target users included online healthcare providers and health consumers. For 16 weeks, we used Twitter accounts (@TREKKca and @Cochrane_Child) and the Cochrane Child Health blog to promote 6 TREKK BLRs and 16 related Cochrane SRs. We published 1 blog post and 98 image-based tweets per week. The primary outcome was user interaction with @TREKKca and @Cochrane_Child. Secondary outcomes were visits to TREKK's website and the Cochrane Child Health blog, clicks to and views of the TREKK BLRs, and Altmetric scores and downloads of Cochrane SRs. Followers to @TREKKca and @Cochrane_Child increased by 24% and 15%, respectively. Monthly users of TREKK's website increased by 29%. Clicks to the TREKK BLRs increased by 22%. The BLRs accrued 59% more views compared with the baseline period. The 16 blog posts accrued 28% more views compared with the 8 previous months when no new posts were published. The Altmetric scores for the Cochrane SRs increased by ≥10 points each. The mean number of full text downloads for the promotion period was higher for nine and lower for seven SRs compared with the 16-week average for the previous year (mean difference (SD), +4.0 (22.0%)). There was increased traffic to TREKK knowledge products and Cochrane SRs during the social media promotion. Quantitative evidence supports blogging and tweeting as dissemination strategies for evidence-based knowledge products.